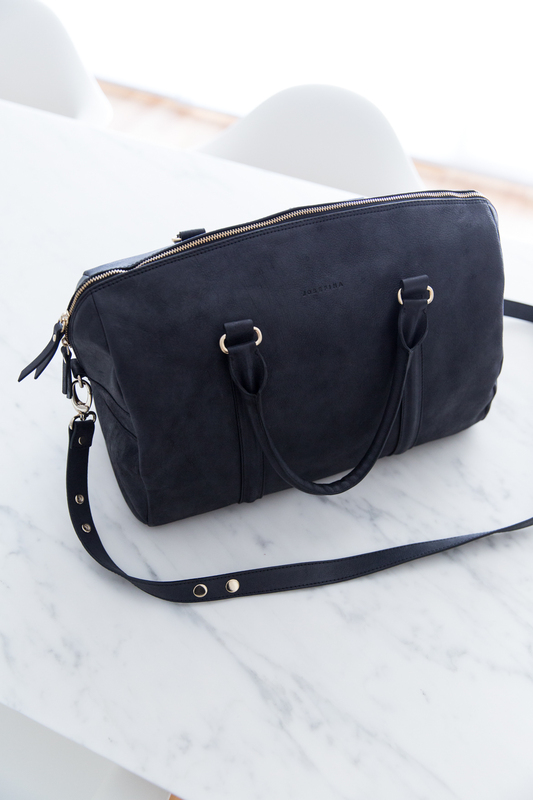 let me start this post by saying ‘not all diaper bags are created equal.’ i own two diaper bags from ELODIE DETAILS which you saw HERE, and i still like them very much. they’re practical, they’re pretty and they’re very different, so i can use them on different occasions or match them with my outfit. but they’re both definitely very casual. and sometimes, a girl wants to class it up and go for something a little more timeless, a little more high-end. 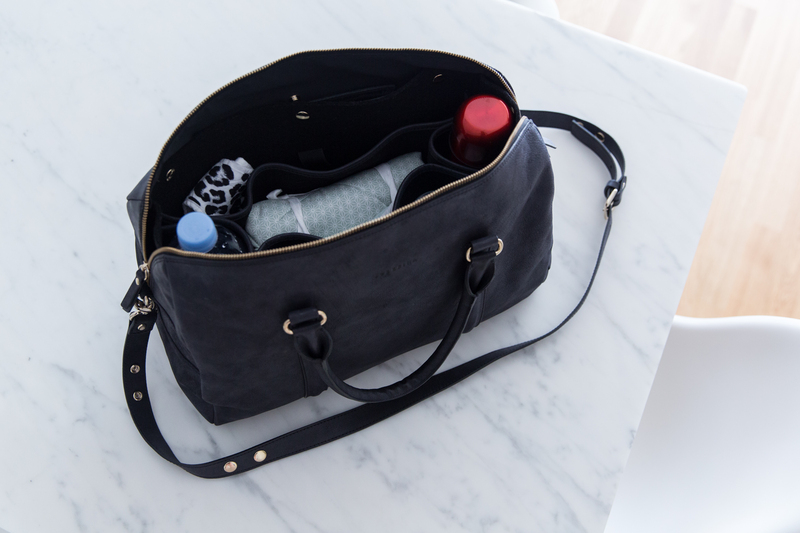 when i first laid eyes on a JOSEFINA diaper bag, i knew there was no way back. 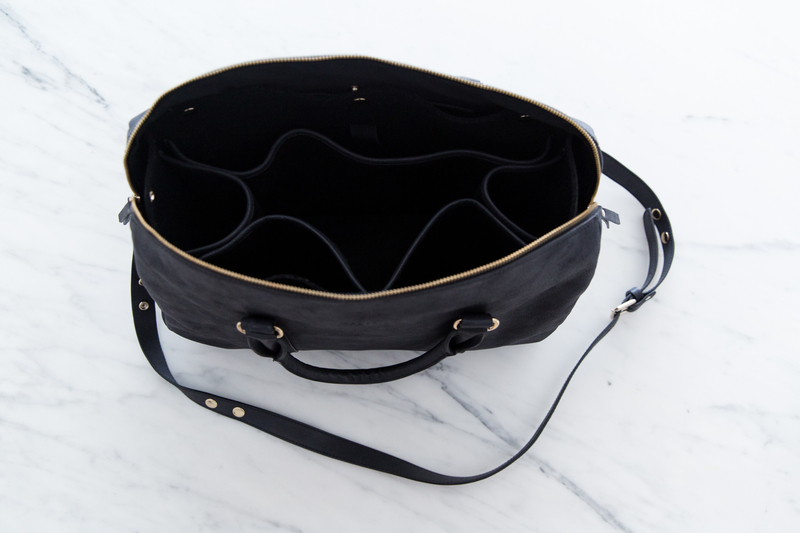 these leather bags are for sure the most beautiful, elegant and stylish diaper bags out there. in the pictures above you’ll notice exactly how beautiful the black version is, but you’ll also see how practical the bag is. i never felt much for the ‘let’s just buy a designer handbag and pretend it’s a diaper bag’ approach. it’s just not real-life-proof, you know? but this bag… it just knows what’s going on in a real mom’s life. 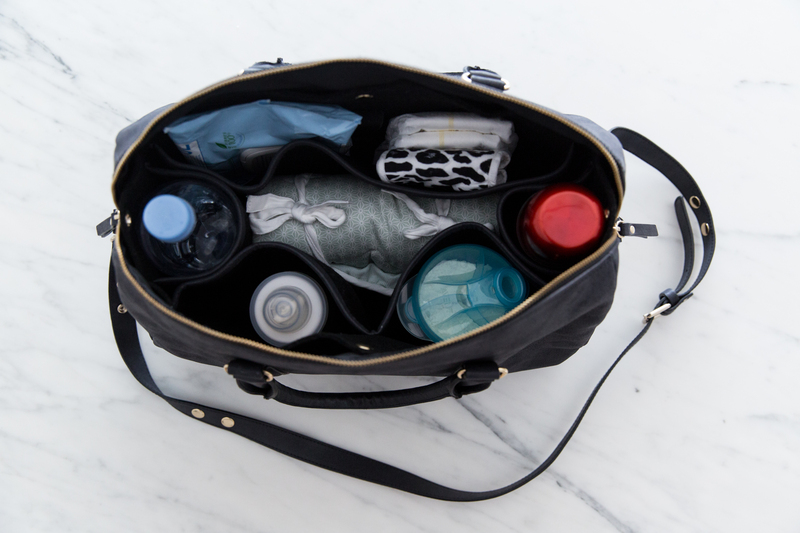 it has different compartments for everything, so that bottles, food, pacifiers and nappies all have their place. and it offers enough space to also hold a (13 inch) laptop, which is just indispensable to traveling mothers like me. because let me tell you – going through the airport with a baby, a diaper bag ànd personal luggage is just not possible, unless you have someone there to help you. in presenting my josefina, i decided to do a little ‘what’s in my bag’ feature for you. mainly because i’m always super curious to see what other women hold in their bags, diaper or other, and also because i wanted to tell you a little about how we roll, this baby and i. recently someone asked me whether i had any motherhood hacks – little tips or tricks that make life easier. at first i didn’t think i had any, as i’m so new at this. but then i realized i might have one. perhaps everyone is doing it like this these days and i am not the least bit original, but just in case i wanted to share this tip with you, because it has given me so much freedom. i always carry a thermos with hot water with me. that way, i just mix a little room temperature evian with a bit of hot water to create the right temperature for juliet’s bottle, and i never have to go looking for a microwave to heat it. i can’t tell you how much stress this has taken away. we have everything we need right at hand, so i can feed her anytime, anywhere. in the car, or even in the airport, because i found out that you can bring any amount of liquids through security when you have a baby with you – as long as you can prove the liquids are for the baby. knowing that has seriously made traveling so much less stressful. i also would never leave the house without my changing mat from CAMCAM. isn’t it the prettiest? it’s nice and soft for juliet to lie on, and when it’s rolled up i can use it as a little pillow on my armrest in the plane to support my arm when holding juliet in my lap. and i’m pretty sure i don’t have to explain the virtues of those avent food containers, right? they carry three portions of milk powder so i don’t need to measure anything on the go. i also alway carry a rather high number of pacifiers with me, because juliet seems to love the game where she spits them out as far as she can. i love the ones by ELODIE DETAILS, they’re so pretty. i also have a paci clip, but sometimes (all the time) i forget to detach it from the stroller. oh, and bibs! i always bring one or two bibs wherever i go. 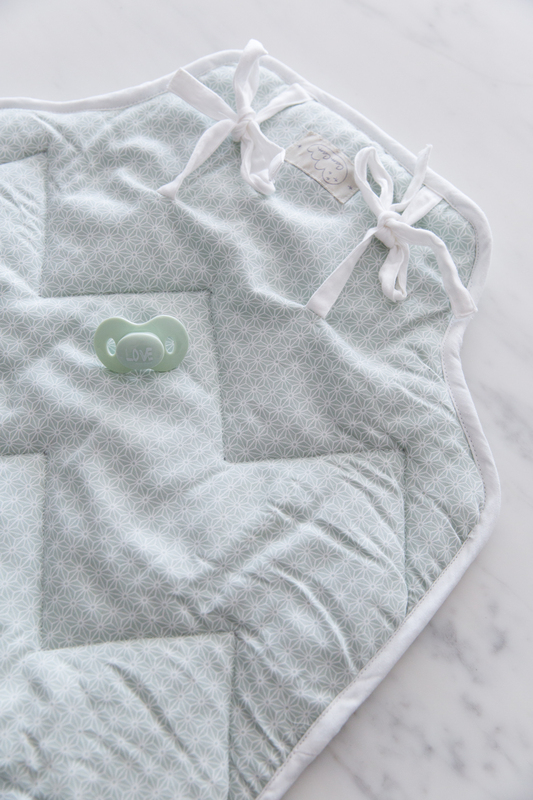 my favorite right now is the perfectly-sized leapard bib by anatology which i got via STUDIOAIMEE.COM. one last little thing – i came across these wonderful baby wipes by KLORANE in france, and i am such a big fan. they’re organic so they contain no harmful chemicals, and they smell delicious. i’m curious to know – which wipes do you use? and do you have any other hacks for a new mom? 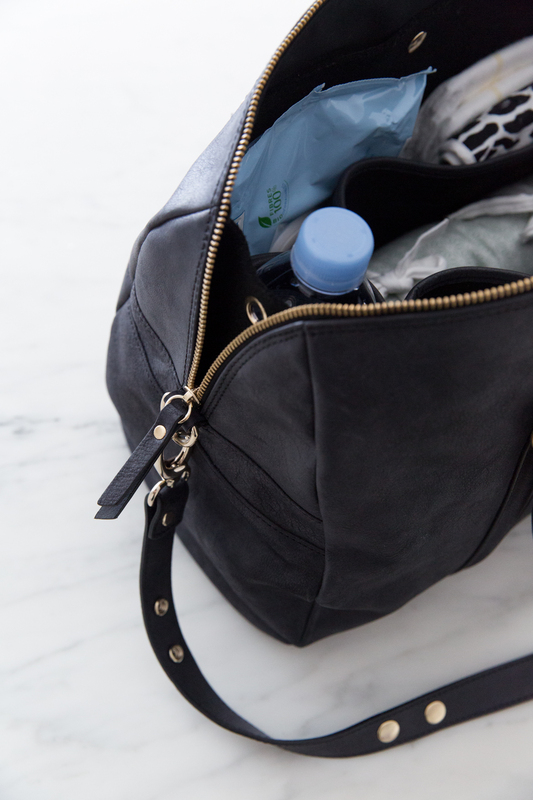 and what else is in your diaper bag? I always carried a clean t-shirt for myself as well…just in case. turned out it came out handy more than once (specially when they are still baby) :)! After breastfeeding, I started to give milk with only room temperature water, so no microwave needed for us. He’s already 18 months now and still drinks it like this, so easy. Thanks for the tip about the wipes. At home, we use dry tissues with cleaning milk, but it isn’t practical out home. Mooi en stijlvol tegelijk, zo hoort dat. :) Fijn weetje over toegestane ml vloeistoffen wanneer je vliegt, had daar totaal geen idee van! 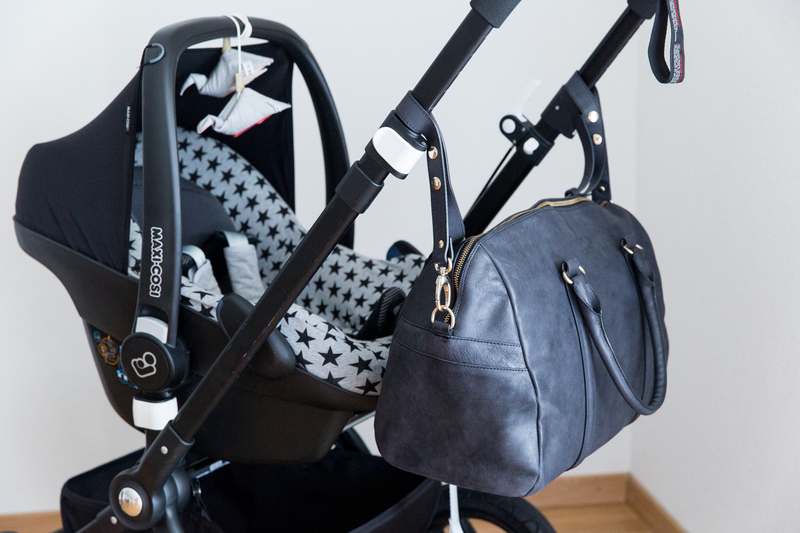 6 months pregnant here and during those sleepless nights in search of the perfect Diaper bag. After a loooooooong search I fell love with the Josefina Bag. I want to order the bag but not sure about the size: which size do you use and would you recommend?